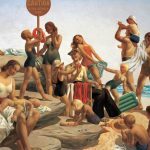 A major touring exhibition from the Art Gallery of South Australia, that includes works by well-known artists such as Preston, Cossington Smith, Beckett, Proctor, Crowley, Bowen, Hester and O’Connor. Curated by Jane Hylton. 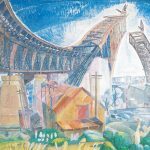 Intoxicated by European and British modernism, a number of Australian women artists in the 1920s pioneered a unique Australian art movement which was adventurous and unconventional. Margaret Preston, Grace Cossington Smith, Thea Proctor, Grace Crowley, Dorrit Black, Clarice Beckett, Ethel Spowers and many others were included in this landmark exhibition. Preston and Kathleen O’Connor were influenced by Scottish artists Jon Peploe and Francis Cadell. Cossington Smith saw work by Camden Town School painters in London such as Spencer Gore and Harold Gilman. The reverberations through the decades of these women’s artwork has affected audiences and artists alike. Sunday 9 September 3pm – Art publisher, Lou Klepac, with artist Nora Heysen, talks about her life and art. Sunday 16 September 3pm – Betty Snowden, assistant curator, Australian War Memorial on Dorrit Black & Ann Elias, Sydney College of the Arts, discusses the work of Nora Heysen. Sunday 23 September 3pm –Lola Wilkins, Head of Art, Australian War Memorial, analyses the work of artist Stella Bowen. Sunday 30 September 3pm –Mary Turner, co-founder of Macquarie Galleries, art patron and former trustee of the AGNSW, talks about work by Jean Appleton, Thea Proctor and Grace Cossington Smith and Jean Appleton, artist, will discuss her life and work. Sunday 7 October 3pm – Elena Taylor, Assistant Curator of Australian Painting and Sculpture at the National Gallery of Australia, Canberra, will discuss Grace Crowley – pioneering modernist. Sunday 21 October 3pm – Linda Slutzkin, curator, will talk about the intriguing work of Freda Robertshaw.